Visit a minimum of 8 small businesses Saturday, November 30th, 2019 for a chance to win one of six, $50 Downtown Boise Gift Cards- provided by Downtown Boise Association & Buy Idaho. Check back this Fall for participating businesses. Rediscovered Books located at 180 North 8th Street. Alexander Davis - 812 W Bannock St.
Stop in to get a head start on your holiday shopping and check out this year's beautifully decorated Christmas tree. American Clothing Gallery - 100 N 8th St.
American Clothing Gallery will be selling handmade heating pillows benefiting the Boys and Girls Club. These beautifully sewn pillows are all made by two local teenagers, Alexa and Grace Johnson. They make great gifts for all your holiday giving! Stop by American Clothing Gallery at the corner of 8th and Main in beautiful downtown Boise and great your shopping started. Complementary gift wrapping on your in store purchases. Art Source Gallery - 1015 W Main St.
We are going to open an hour early and stay open an hour later (9am -7pm) and will have various artists in 2 hour shifts helping customers create make it and take it art for a small materials fee. There will also be a photo booth set up for fun photo shenanigans. Atomic Treasures - 409 S 8th St.
Come by on Small Business Saturday for 10% off everything in the shop! Banana Ink – 214 N 9th St.
We will be offering discounts ranging from 10-30% off. Customers will receive a balloon upon entering the store that has a coupon inside it for a discount off their entire purchase. We will also have free coffee, tea, and cookies provided by a coffee cart and we'll also be raffling off a gift basket valued at $100! Bandanna Running & Walking - 504 W Main St.
Bandanna will offer an additional 24% off (to recognize our 24th year in business!) any item already on sale. We will also offer a “buy one get one free” on all running shorts and bras (see store for details). These sale prices will only apply on Saturday, November 24th. Barbarian Brewing Downtown Tap Room - 1022 W Main St.
Barbarian is releasing two barrel aged beers on Small Business Saturday- Elixir of the Gods: Sour Belgian style Quadruple aged in Port barrels and finished with pomegranates. 12% abv. The Morrigan: Bourbon Barrel Imperial Stout. 12% abv. Boise Art Glass - 1124 W Front St.
We will be offering 5% off of all classes and 15% off of all gallery items. Shop 40+ small businesses, all in one place! Come by and gather ingredients for your local-food holiday dinners and more. Bonefish Grill - 855 W Broad St.
We're locally owned and operated! Stop by while you’re supporting businesses downtown for $6 Bang Bang Shrimp and a $6 Martini. Buns in the Oven - 413 S 8th St.
Join us on Small Business Saturday for terrific shopping AND yummy snacks & beverages! Always free holiday wrap & gift tags (with purchase). SAGE INTERNATIONAL SCHOOL FUNDRAISER: BITO Team Members Simon & Matthew will wrap ANY of your holiday gifts for just a $2 Donation Per Gift to their Washington DC/NYC School Trip Fund (BITO will donate all of the packaging and supplies to make your gifts look FABULOUS)! SMALL BUSINESS SATURDAY ONLY OFFERS: 30% OFF* CLOTHING - Baby, Kid's and Women’s and Blankets and Bibs | 25% OFF* NURSING BRAS and Diaper Bags | BUY ONE/GET ONE* HALF OFF ON TOYS & BOOKS! BONUS LIMITED SPECIALS THROUGHOUT THE DAY ~ CHECK IN EARLY FOR DETAILS! Buy Idaho Members - 412 S 6th St.
Support Local Businesses and Shop Local on Small Business Saturday! The Grove Plaza will host over 60-Local Vendors 10:30-2:30 selling unique, Idaho made, handcrafted items to satisfy everyone on your Holiday list! Chandler's Steakhouse - 981 W Grove St.
Chip Cookies - 501 W Main St.
We’re open 11am-2am: Our season feature and flavor of the month is our Pumpkin Nutella Chip cookie! It's a pumpkin spice cookie with milk chocolate chips stuffed with Nutella. City Center Wines – 574 W Main St.
Come in for a free wine tasting from 1-3pm. Coiled Wine Bar - 813 W Bannock St.
Crazy Neighbor - 1415 W Grove St.
Refreshments and SPECIAL SALES: 15% off all Ornaments, 10% Off everything else in the store! ONE day only Sale. District Coffee House - 219 N 10th St.
Stop in for a free cup of coffee when you buy a bag of coffee beans! D.L. Evans Bank - 890 W Main St.
DL Evans Bank supports small businesses! Stop by during the week leading up to Small Business Saturday and pick up a printed passport. Downtown Boise Association - 101 S Capitol Blvd. Eyes Of The World Imports – 1576 W Grove St.
“Going Green Eyes Of The World Imports ‘Say no to plastic’ canvas tote bags”... to our first Lucky 13 customers before 12noon! Take 10 % off One Item purchase between 10am & 2:00pm that day! (Must mention DBA Small Business Saturday promotion to get it). Open 10-6 on Small Business Saturday. FireFusion Studio - 1124 W Front St.
Join us for 15% off gallery items and 5% off classes. Flying M Coffee House - 500 W Idaho St. Spend over $50 in the gift shop and get a custom made pair of Flying M socks for free (a $12.25 value!). Foot Dynamics - 1021 W Main St. This holiday season, give the gift of comfort! Purchase a $100 gift card, and receive a $20 gift card FREE! *Can't be used on Small Business Saturday. Form & Function - 511 W Broad St. The Fulton Complex – Corner of Fulton & Capitol Blvd. Join White Dog Brewing, LongDrop Cider and Gas Lantern Drinking Company for Small Business Saturday and enter in a drawing for a Traeger Tailgater Pellet Grill. One Entry per visit, per customer. No minimum purchase amount required. Winner will be announced Sunday, so come by! Gallery 601 - 211 N 10th St.
Come Play the "Gift Tree Game”- a discount give away. Come down to the gallery and by playing the gift tree game you can win up to 40% discount on artwork. Gas Lantern Drinking Company – 701 Fulton St.
We're teamed up with the Fulton Complex and giving away a Traeger Grill- stop by on Small Business Saturday to enter! Global Travel - 900 W Jefferson St.
We've got a great deal for customers! Cruise specials with $1.00 deposits, specials on all Disney Packages, Hawaii packages from $624.00, and above all – Complementary Vacation planning! We will also be offering all customers our Hot Chocolate Bar with all the toppings, Hot Cider, cookies and other treats, and door Prize drawings throughout the day! Graeber & Company – 350 N 9th St.
20% off Aveda open stock at Graeber & Company for small business Saturday. Guru Donuts – 928 W Main St.
Open regular hours, 8-4pm and featuring our seasonal menu! Find out more about our Be A Donut Guru contest - we are also taking submissions through Nov 30 - all proceeds go to the charity of the winner's choice! Idaho Blueprint & Supply Co. - 619 W Main St.
Idaho Blueprint is open Saturday’s from 9-3, and to celebrate Small Business Saturday, we will be giving away an art kit to all the kiddos that stop by. So, let’s kick off your holiday shopping with our wide selection of art supplies, a map, or maybe a gift card! Idaho Made – 108 N 6th St. In addition to our store full of amazing curated gifts, we will have the hallways lined with talented pop-up vendors who will be here for one day only. Tables will be full of delicious treats to feed you and your family, keeping everyone happy while they shop. Sawtooth Glass will once again be dazzling viewers with their glassblowing techniques and we will have candy sampling. Idaho Steelheads Pop Up Shop – 233 S. Capitol Blvd. Keystone Station – 222 N 9th St.
All-store sale! Receive a free pint coupon to Payette Brewing with any purchase from 4-6, they'll also be sampling beers in the shop! The first 10 purchases on Saturday will get a free KEYSTONE mug. LaNeige Bridal – 1020 W Main St. Lemon Tree Co. – 224 N 10th St.
We will be offering $2.00 off all sandwiches, $1.00 off lemonades, beers, and wines, and 2 for 1 Cutwater Bloody Marys or Gin & Tonics. Longdrop Cider - 603 S Capitol Blvd. Longdrop Cider is discounting $1.00 of pints to customers who bring in coats or blankets to donate to our local shelters. Support a local business and help a local in need. We’re also partnering with our neighbors for a Traeger giveaway! Come by to see details. LunchBOX (A WAXING SALON) - 818 W Idaho St.
Come in for a service and spin the prize wheel! Every guest that completes a service on Small Business Saturday is able to spin the Lunchbox wheel for a prize (mini product samples, discount cards, and other Lunchbox swag)! We also have deals on wax packages- Buy 5 get one free! Maven - 928 W Main St.
Home to Nana's, The Garden City Projects & Mullet Proof. We will be highlighting artists Brigette Nelson, Grey Jays, Skinny Dip, Cipi Butler, Ambrose Grey, and many more. McU Sports - 822 W Jefferson St.
Stop by for a chance to get a McU Sports hoodie throughout the day or a chance to get a $50 gift card for regular priced items. Meraki Greek Street Food – 345 S 8th St.
Come by today for a free order of baklava with any entree purchase. Mixed Greens | Modern Gifts - 213 N 9th St.
Stop by on Small Business Saturday for 20% off any 1 item, treats, and free gift wrap. Meriweather Cider - 224 9th St.
We're open 12n-10pm! "Meet Your Cider Maker" : come down and sample ciders in the works as well as sign up to be notified when we are putting on a cider-making workshop. Join us from 5-9 at the Cider House in Downtown Boise! Old Boise Pioneer Tent Building – 106 N 6th St. The Old Boise Building is always a magical place to begin your holiday season. The Scale Model Railroads will be running in the basement from 10a-4p, and Santa will be in his sleigh on the second floor from 12n-4p. Lots of small businesses inside with in-store events! Olivin – 218 N 9th St.
Olivin will be offering the following specials: $10 special flavor vinegar, 6.7 ounce bottle, pairing gift packages with ornaments are $25.00 and $5.00 added to $25.00 gift card purchase. Piece Unique Clothing Co. & Shoez - 205 N 10th St.
We are expecting a visit from Mr. & Mrs. Santa Claus, courtesy of the Boise Firer Dept. 11-2 Saturday 11/24 in the lobby of Piece Unique! Pictures to be taken, Beverages and treats served. Piece unique starts the annual toy drive along with Boise Firer Dept. Until Dec. 19th bring in a toy or donate $20 and receive 20% off any one item in piece unique, the cash is used to purchase gift cards for deserving teenagers. Toys & gift cards are donated and distributed to local hospitals, shelters & deserving children. 1 free hour parking in the lot next to US Bank! Proof Eyewear - 314 S 9th St.
Come in today for free coffee and hot cocoa, sales up to 70% off and a Free Frame Giveaway/raffle! R. Grey Jewelry Gallery – 415 S 8th St.
We will be serving Hot Cider and treats and offering 10% off any hand blown glass purchase for Small Business Saturday. Rediscovered Bookshop – 180 N 8th St. The Holiday Catalog is here! Wheel of Fortune Book Tastings and much more! Begin your holiday shopping with us at your local independent bookstore. Revitalize Juice Bar – 560 Main St.
We will be open 10-5. Offering a free latte/hot chocolate of choice with any purchase! Gift Certificates on sale, Buy $25, get $5 free. Rise & Grind Boise - 211 S 6th St.
Stop in and pick up your 50% off coupon on Small Business Saturday. Robert Comstock - 765 W Idaho St.
Come in and warm up with Hot Cocoa and Biscotti while you shop! Ruby Lou Clothing Boutique – 130 North 8th St.
Come in for 20% off storewide! SHIFT Boutique - 807 W Bannock St.
All-store sale! Receive a coupon for Coiled Wine Bar with any purchase from 5-7pm. Any purchase over $100 will receive a free tote bag. Snake River Tea – 801 W Main St.
Stop in for Small Business Saturday: Free tea pot with loose leaf order of $50.00 or more, or Free holiday steeper with loose leaf order of $35.00 or more. Swell Artist Collective - 404 S 8th St. The Chocolat Bar – 805 W Bannock St.
We will do a Buy One Get One for our truffles! Our truffles have never been on sale. It is for a limited run - our decadent dark chocolate truffles will be pre-boxed in two packs and sold for only $2! Limit two boxes per person, and only 100 boxes are being made. The Grove Hotel – 245 S Capitol Blvd. Come down and purchase a hotel gift card and enjoy 20% bonus on all card purchases (valid toward hotel stays, dining in Trillium restaurant or the Bar). Enter to win a complimentary night stay in a deluxe room with 2 hockey tickets to an Idaho Steelheads home game for 2. The Mixing Bowl - 216 N 9th St.
Stop in for some great Small Business Saturday specials: knife and Idaho cutting board special , 20% selected knives and cookware, $20.00 Aeropress with the purchase of $75.00 or one free when you spend $150 and $5.00 added to $50 giftcard purchase! The Record Exchange – 1105 W Idaho St. Title Nine - 170 N 8th St.
Trillium Restaurant – 245 S Capitol Blvd. Ward Hooper Gallery & Vintage Swank - 745 W Idaho St. Wear Boise – 828 W Idaho St.
White Dog Brewing Company – 705 W Fulton St.
Come in for a drawing to win a Traeger! Shop Small is a nationwide movement that celebrates small businesses and helps communities thrive and stay vibrant. Small Business Saturday is a special day each year, the Saturday after Thanksgiving, dedicated to visiting, discovering and supporting the small businesses in our community. 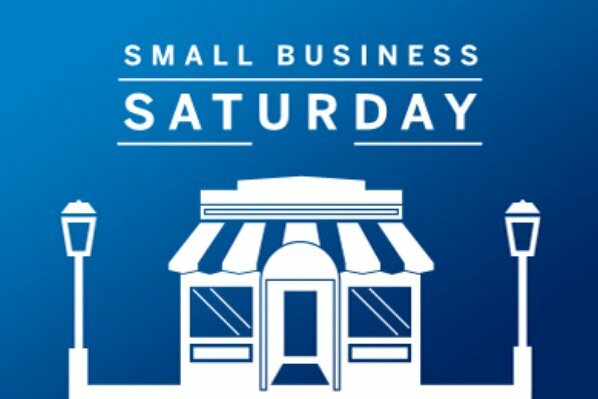 Anyone and everyone can get in on the fun of Small Business Saturday. It’s an easy way to discover some of the amazing shops Downtown Boise has. Get up, get out and shop or dine at local small businesses, invite friends to shop with you, and share on your social networks where you #ShopSmallBoise. If you’re not sure which businesses to visit, you can head over to downtownboise.org for a full listing of participating businesses and some of the cool things happening in their stores. Small Business Saturday is proudly championed by members and merchants of the Downtown Boise Association. THANK YOU for supporting your neighbors through Shopping Small! Shop Unique… Dine Well… Support Local! BE Downtown Boise!